YOUR CHRISTMAS TREES ARE HERE! All the way from North Carolina, the State that produces the highest quality firs, come our beautiful ‘premium grade’ Christmas trees. Our trees were cut at the last possible moment and transported in a closed and regulated environment. Why do we go through all these troubles? 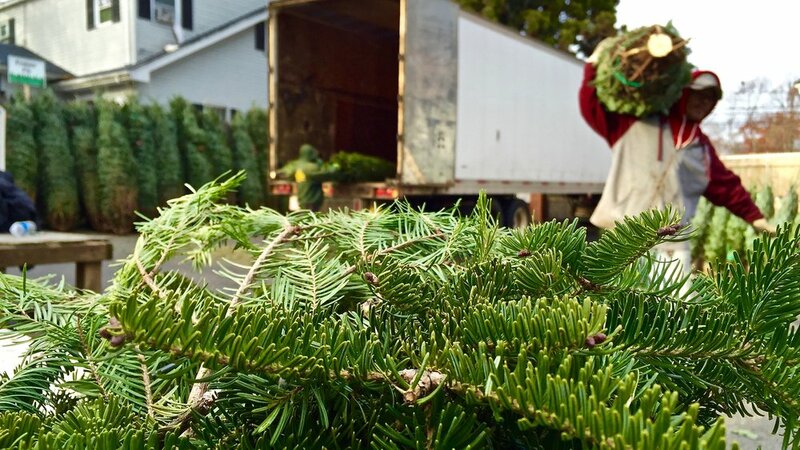 .. to keep your tree in the best possible condition and it won't needle a week before Christmas, your ornaments won't have to hang on bare branches and your presents won't be covered with dried up greens by the time the festivities begin. Before you leave our grounds, your tree will be baled & a fresh cut will be made. If you don’t have one already, come inside and pick out a tree stand that is sturdy enough to support your tree and capable of holding adequate water. As soon as you get home, place your tree in a bucket of warm water until you are ready to bring the tree inside. If you live nearby, you can place your tree into it’s stand right away, if a couple of hours have passed we suggest that you make a fresh cut (if possible) before you place the tree into the stand. Check the water level in your stand daily and replenish as needed. A STAND, A WREATH AND A HOOK? Our beautifully decorated fresh Christmas Wreaths will add so much to the Christmas Spirit in your home and our Evergreen Christmas Garlands will create the visually stunning effect you are looking for while filling the space with the fragrance of the holidays. We also carry a wide variety of wreath hangers for any door in the house, suction cup hangers for windows, bows, lights, decorations and absolutely everything else you might need to make this Christmas the most special one for you and your family. Every imaginable decoration can be found glistening from our aisles and floors at the Christmas Shoppe. A large variety of the finest Christmas Ornaments, hand picked Christmas Decorations and Unique Gifts featuring our exclusive Northport Ornaments and including Snowflake, Snowman, Santa Claus, Nativity, Religious, Angel, Ball, Bell, Nutcracker, Icicle, Gingerbread, Fairy, Elf & much more to decorate your Holiday Christmas Tree. Hanging Christmas Ornaments on your tree adds merriment and beauty to your home during the holiday season and has been a long standing tradition. Ornaments are handed down from generation to generation. Ornaments for your Christmas tree can signify a new love, a new home or simply your favorite thing to do. From playful to traditional, from fun to artsy, we offer the perfect assortments to continue your collection and to create lasting memories for years to come. something special, our local northport collection!